This post contains affiliate links and I will be compensated for purchases made. Thanks for supporting MamaGab! Are you prepping for the holidays yet? We’ve only bought a handful of gifts so far, but I’m already thinking about how I can get ready for Christmas, one of my favorite times of the year. I love to be intentional and have Christ-centered activities in mind for our kids and Christ-centered decorations for our home. That’s one thing I love about DaySpring. All of their Christmas items point to our Savior. 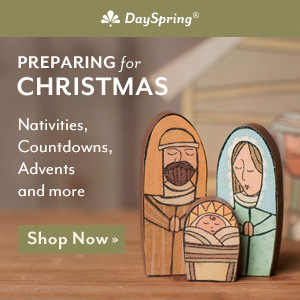 If you want to start collecting things to decorate your home for the holidays, you can check out DaySpring’s Christmas items. They’re launching their Super Deals this week, and every week, another set of items will be a part of their huge sale–up to 70% off–through December 3. I’ve also gone through and selected some of my favorite things that I thought moms with young children, like mine, would especially enjoy. This holiday countdown is one of my favorites. It’s affordable (only $10) and can be used for multiple holidays because you can turn the boxes around to create a different picture. The platter would make a great teacher gift, but so would a sweet coffee mug. All mugs, tea cups, and water bottles are buy 2 get 1 free right now, so you could buy all of your gifts for Sunday School teachers at one time. I actually own and love the Blessed & Loved – Teacup with Lid. It’s my favorite! How are you prepping for a Christ-centered and hopefully stress-free Christmas?